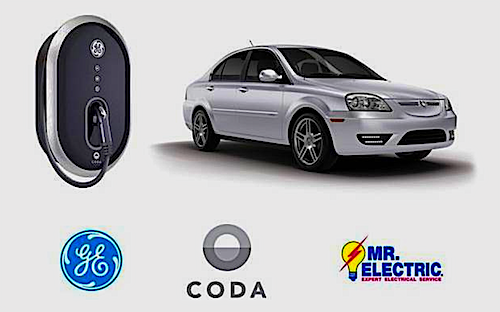 CODA, GE and Mr. Electric are working together to bring you a free charger and installation. That’s $2,000 off the all-electric CODA total to throw in your cost analysis. CODA has great news for those of you still shy about electric cars and the costs associated with them. From now until December 2, 2012, if you are a resident of California and purchase a new 2012 CODA Sedan, you will receive a complimentary home Level 2 charger from GE WattStation Wall-Mount charger. That’s a value close to $2,000 of free equipment. To sweeten the deal further, GE, CODA and Mr. Electric will throw in a home assessment and installation by Mr. Electric. Mr. Electric is CODA’s preferred provider of electric vehicle supply equipment, EVSE installation services. Total Cost Of Purchase Minus Some. Buying an electric car is more than just the price of purchase as we amply wrote about previously. Almost all electric cars are eligible for government tax rebates if you are in the right tax bracket. Local and state incentives can be added which bring this all-electric $39,900 car below $30,000 in certain parts of California. But once you start to add a home charger, usually around $1,000 to 2,000, plus electrician’s fees and more, that saving you had goes into making sure you can pump electricity into it. Essentially, that $2,000 charger and an additional $800 for the installation and wiring of electricity is knocked off the all-electric CODA for your cost analysis. Technically Speaking. The numbers are based on a standard Mr Electric price home assessment cost of $99 and the standard residential installation fee of $699. The standard installation involves bringing in a new 40 amp circuit, 8 AWG wire required to a residential electrical service panel located within 50 linear feet of proposed location for EVSE in the same room. The electrical service panel installed has a physical space and capacity to accommodate a new circuit, which includes the wiring in the garage to the EVSE will be routed per code. The installation will be done according to the obligatory permitting and will comply with all NEC, state, local and/or other municipal electrical codes, notwithstanding anything to the contrary, costs and fees associated with obtaining any necessary licenses or permits are not included in the pricing set forth above. In case you are still confused about doing a complete cost analysis, you’re in luck. The CODA website provides a smart calculator to help you determine how to make sense of your electric car, or simply whether or not an electric car is right for you. That is something I like about this company, they are smart enough not to push a product you will be disappointed with in your garage and would rather have happy campers. We tried my wife’s 2002 Subaru WRX which is driven about 10,000 miles a year, yield 22 MPG at $4 a gallon, and an average of our electricity cost from Southern California Edison at 13 cents a kWh. This returned a gasoline cost saving or $2,020 a year, with a yearly increase in electricity of $460 (we pay $20 to 30 a month currently), altogether totaling $1,560. That would make us use the car everyday for a few years and even throw in a few solar panels to increase the savings. We did the same calculation on WattPeople with a $5,000 down payment and a 10 year loan at 3.3% and found a solar panel installation would only make sense the following year. Those numbers were based on a project gross increase in gasoline of 10% or more and 7% or more for electricity. In the meantime, while we predict the eventual future of the winners of the electric car race and all eyes turn to the mainstream carmakers offering some sort of electric cars, the smaller, more nimbler players such as CODA and Tesla will have to strike strategic alliances with electricians, solar panels companies and most importantly home charger companies. This will help them take advantage of something bigger carmakers are reluctant to do, outsource. Will a free GE WattStation Wall-Mount charger be enough for you to go out and buy an all-electric CODA?